Watch full RWBY Season 5 Episode 2 full HD online. Cartoon video RWBY Episode 54 online for free in HD. In Kuo Kuana, Blake and Sun search for a male Faunus. They corner him, but he flees after briefly attacking them. Blake and Sun are separated during the chase. In a flashback, a younger Blake asks fellow White Fang member Ilia why she joined the organisation. The Chameleon Faunus explains that she grew up as the daughter of Dust mine workers in Mantle. Because she has no apparent animal trait, her parents managed to enroll her in a human school. They wanted Ilia to conceal her Faunus identity, telling her to never change her skin color. Ilia was content with life in Atlas, despite her human friends’ discriminatory attitude towards Faunus. However, her identity was discovered when her ‘friends’ laughed about a deadly cave-in in the Dust mines, which killed Faunus workers. Ilia cried, lost control of her emotions and changed her skin color. Blake feels sorry for Ilia, who tells her not to be: she punished the human girls by breaking their teeth. In the present, Ilia intervenes in the chase. She and Blake don’t directly attack each other. 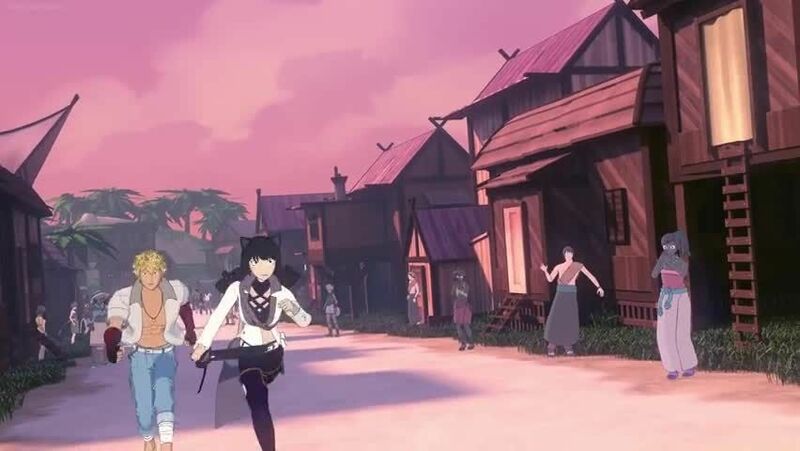 Instead, Ilia covers her and the other Faunus’ escape, while Blake apologizes to the arriving Sun for losing their target.